After such an enthusiastic response to our PORK BUTCHERY CLASSES, we've added FEBRUARY DATES! Our two-hour Saturday afternoon Pork Fabrication Class is an interactive demonstration with Terry. He will break one side of a SAGE FARM raised pig, field all of your questions, identify and discuss the attributes of each cut of meat and give pointers on how to best prepare them. 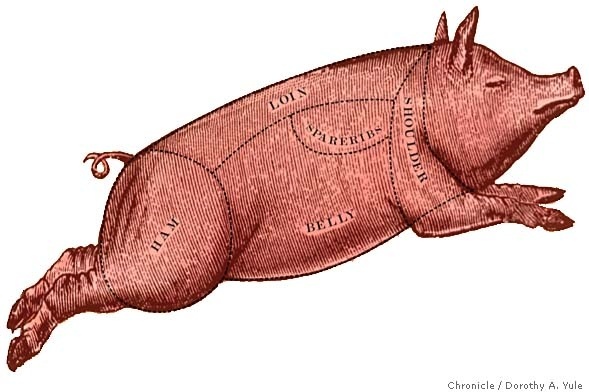 In addition to instruction on seam butchery technique and whole muscle utilization, each student will take home a generous supply of mixed pork cuts. To ensure the best possible experience, this will be an intimate class limited to six students. We are offering the class on two dates: FEBRUARY 20th and FEBRUARY 27th. Each class will last two hours, from 1-3pm and cost $100. This price includes instruction and pork for you to cook at home. Please either email or call the store at (413)727-3409 to reserve your spot, as these classes fill up quickly.